As a nursing student, how can digital resources help my training? Universities expect their students to access online learning as part of their nursing studies. For example, nursing students at London South Bank University’s school of health and social care are issued with tablet computers at the start of their course, and they use apps and digitally based resources throughout their training, including on placements. ‘It engages students in a way of learning that they are very familiar with,’ says associate professor Gary Francis. Perhaps most importantly, it also helps to prepare students for their professional life, when they will be expected to use digital technologies as part of their daily nursing practice – for example in finding, recording and sharing information. I want to use e-learning in completing my continuing professional development (CPD). Where’s the best place to start? As with any other form of learning, your starting point should be what you need to know, so begin with some personal reflection on your practice. What types of online learning resources are available? It’s important to be discriminating about what you use and check its authenticity. ‘We always advise students to be careful,’ says Professor Francis, who cautions against using informal platforms such as YouTube without careful investigation first. For Dr Hatchett, while quality is always a concern, resources don’t always have to be peer-reviewed. ‘I think we need to be broader, because there is lots of good stuff out there,’ he says. How do you check that what you are using is reliable? Look for resources that are quality assured or externally validated. If you are unsure, seek advice from your lecturer, mentor, professional colleagues or your RCN learning rep. ‘Generally speaking, always think about where your information has come from,’ says Professor Francis, who advises asking whether what you are planning to use has been produced by and for healthcare professionals. Reading comments left by the digital community may also be a valuable indicator of its quality, says Dr Hatchett. The University of Edinburgh suggests a range of different ways to check the accuracy of website content. These include whether there is enough information to establish the author’s credibility and their qualifications to write about the subject, whether the text is well-written, free of spelling mistakes and grammatical errors, whether it includes working links and verifiable sources, and when it was last updated. The university also advises looking at the web address – the URL – of the site to help establish whether the information is published by a credible source. For example, if the address includes ‘ac.uk’ this shows it is a UK-based university. Are there any free online resources? 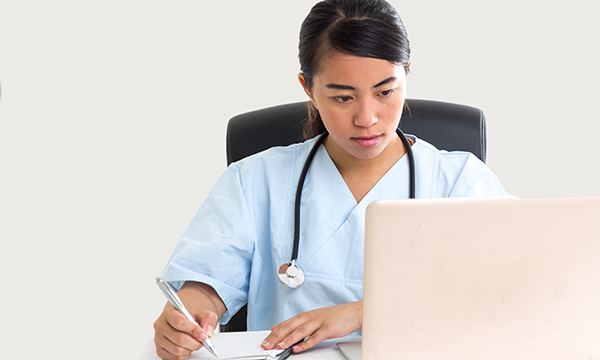 The RCN provides some free online learning that may help with your continuing professional development and revalidation. Subjects include continence, diabetes, end of life care, motor neurone disease and first steps for healthcare assistants. The charity Education for Health provides free e-learning across a wide range of clinical areas, with a focus on long-term conditions. Subjects include asthma, diabetes and chronic obstructive pulmonary disease. Future Learn – owned by the Open University – offers a variety of free online nursing courses provided by leading universities and medical schools. These include the impact of compassionate care, understanding and managing challenging behaviour in patients with dementia, and supporting people with long-term conditions. If you want to access tests or obtain a completion certificate, you will need to upgrade by paying a fee. What about those you have to pay for? Check with your employer to see if it has subscriptions with any of the leading providers. These may include clinicalskills.net, a fee-paying service used by many NHS trusts, UK universities, private healthcare companies, care homes and training providers. With content pitched at both students and registered staff, it has more than 250 guidelines on clinical skills procedures written by specialist authors. These include treating pressure ulcers, assessing constipation and oxygen saturation monitoring. Skills for Health is a leading provider of healthcare e-learning, providing a range of courses, with access bought by organisations for the use of their staff. These include statutory and mandatory skills such as infection prevention and control, moving and handling, and safeguarding. Clinical skills include consent, duty of care, mental health awareness, privacy and dignity, and dementia. RCNi Learning has 135 interactive and evidence-based learning modules, all accredited by the RCN and peer-reviewed by experts. They are targeted at both registered nurses and nursing students. Fees depend on whether you subscribe only to the learning or add your choice of journal. Individuals can also register for three free modules. Subjects covered include alcohol-related liver disease, non-Hodgkin lymphoma, paediatric anaesthesia, paracetamol poisoning, and breaking bad news. How do I prove what I’ve done? What records should I keep? Digital learning can help you to revalidate. But you must maintain accurate records, says the Nursing and Midwifery Council in its guidance. You should include the method, the topic and how it relates to your practice, the dates it was undertaken, the number of hours, the part of the Code most relevant to your chosen CPD and evidence that you did it. Some digital learning, including that offered by RCNi, allows you to print a certificate to prove you completed it. ‘You can also take a screen shot, showing the activity has been done,’ says Dr Hatchett. As a minimum, keep a record of the links you have used and the dates accessed, so you can provide a verifiable audit trail if necessary. RCNi Portfolio complies with all the NMC’s requirements for e-portfolios. It uses a traffic light style system, so you can see at a glance how close you are to compiling everything you need to revalidate. It also allows you to build your evidence quickly and easily, with a library of CPD articles and interactive self-assessment exercises, accessible on any device, including smart phones and tablets.